After enjoying the first, I finally picked up the second volume of Trinity last week! I can definitely say I enjoyed this one too, and there is quality here even if the book does feel a little disjointed. Let’s jump right in! Unfortunately (fortunately? ), we must leave this question for what I’m assuming is the next volume, as the following issue is a tie-in to the wonderful “Superman Reborn” event of last year. Cullen Bunn writes this issue as well with art by the decent Emanuela Lupacchino, but again, things just feel off, somehow. The dialogue is completely out of character, with Batman either panicking or cracking jokes and Superman completely confused for the entire issue. The story also has nothing to do with the previous issue, nor Manapul’s first story arc, nor the subsequent arc. Even though this chapter of the book didn’t do much more for me than Bunn’s first, its saving grace is the fact that it was a tie-in to an event in the main Superman books. Giving different creative teams a chance to weigh in on big goings makes for fun reading, even if it wasn’t completely perfect, and more books tying into the same event does make it feel epic. After these two issues, the book goes back to Francis Manapul, who is definitely the star of the show. As he did with the first volume, he writes, pencils, inks and colors the remaining three issues of this one, which are a direct continuation of the story he began in the first volume (despite their publication history, one wonders why the Manapul’s issues weren’t just put at the beginning of the book). The story arc begins with Superman, Batman and Wonder Woman still working through their ordeal with Mongul and the Black Mercy, and continues with an alien invasion of the Justice League satellite. A revelation about the aliens on the satellite is made later on, which felt very Star Trek-ish in that things were not initially what they seemed, and the League has to get to the bottom of it. The story has nice action and some decent moments, and completes the book nicely, making up for the disjointed feel of the first two chapters. 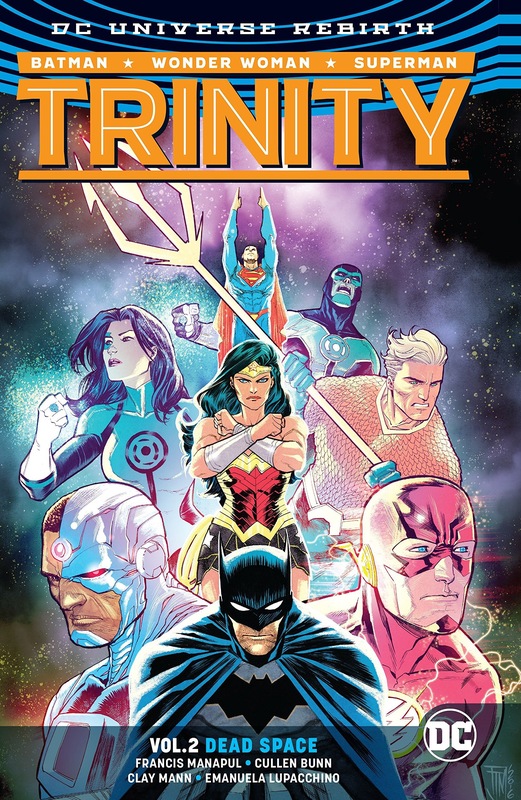 If you like superhero team-up books or Justice League stories, you’ll probably enjoy Trinity a great deal. It is always fun to see heroes working together and has a little more depth than a story normally would that featured the entire League. I enjoy Francis Manapul’s art a great deal as well, as he knows how to convey action and emotion and, most importantly for a book like this, he knows how to draw each of the Trinity well. Seeing him draw the rest of the Justice League fighting an alien race which makes for good fodder is a lot of fun. That said, whenever you have eight or more superheroes working together, you don’t really have a whole lot of room to jump into character development at any point, which is a little disappointing as it has been a strength of the Superman books during Rebirth. Unlike volume 1, Lois and Jon are nowhere to be found in volume 2, and only mentioned one time in the story that I can recall. They have been featured in all of the other Rebirth books, and many fans, including myself, have gravitated toward this new take on the character a great deal. I realize that Bunn or Manapul didn’t have a whole lot of room to include them in this book, as its title is not The Kents, after all, but I still could have used a little more. I find it makes Superman far more interesting as a character and we get to explore a lot of new ground. Ultimately, I enjoyed both volumes of Trinity, but I didn’t find it to be quite as strong as its counterparts, Superman and Action Comics. When Superman as family man is not present, the story becomes just another Superman or Justice League book which, admittedly, isn’t a bad thing, but is a letdown if you’re looking for a companion book to the other two titles. Francis Manapul is a talented comic creator and I will check out work he does in the future, and would even be interested if he were to do a Superman book one day. His talents though, aren’t quite enough for me to give this a positive grade, or even pick up the next volume of Trinity.